Nexus 7 3G tablet owners may enjoy this next piece of news as we share with readers that a new Android 4.2 Jelly Bean MoDaCo ROM is now available for the device. This custom ROM will bring a lot of pleasure to users who enjoy customizing their device and is resonant of a stock Android experience based on the JOP40C firmware build. The ROM for the Nexus 7 3G touts plenty of optimizations, tweaks and improved features with stock UI and is rebuilt and optimized with the MCR build system, tethering enabled and SMS enabled. It includes Flash player with Jelly Bean browser, updated Google components, SuperSu from Chainfire XDA, camera launcher, LatinIME, secure boot image and with patched ADB, enhanced power menu, Amazon and SlideMe Market alternative appstores, Titanium backup and more. News of the ROM came to us from IBTimes and more features of this ROM include tweaking of the size of the bottom navigation bar, multiple button configurations and the ability to move to the right hand side of the device when in landscape mode. 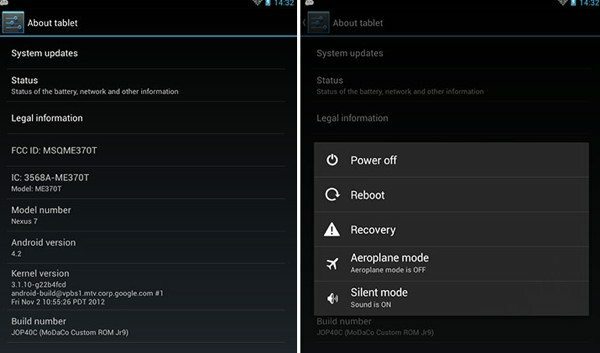 You can see a full list of the 4.2 MoDaCo custom ROM features at the IBTimes link above. We must stress that this ROM is only compatible with the 3G Nexus 7 model and you can check out your tablet’s model number by hitting Settings and then About Phone. Also if you are going to flash this ROM remember to back up all of your important data, apps and settings before you begin and ensure you have at least 85% of battery charge to avoid shutdown whilst installing the 4.2 Jelly Bean update. Other things to do before you download the ROM include making sure the correct USB drivers are installed for the Google Nexus 7 3G, enabling USB debugging mode, and checking that the device bootloader is unlocked and rooted with preinstalled ClockworkMod recovery. At this point you’ll be ready to download the MoDaCo 4.2 Jelly Bean ROM. Please note that at Phones Review we never recommend customizing your devices and that if you choose to do so then the responsibility is entirely your own. Nevertheless we know that many of our readers enjoy customizing their phones and tablets and so enjoy bring you the relevant information. Full instructions for installing the ROM can be found at the earlier IBTimes link above and the link to download the ROM can be found here. We’d really like to hear from readers who try out this custom ROM for the Nexus 7 3G tablet. Did everything go smoothly for you and what do you think of the results? Maybe you have already installed the ROM and can recommend it to other readers? Let us know with your comments.